If you are an Evil Overlord (EO), you need minions — everyone knows that. In fact, it's probably the first rule of being an EO. 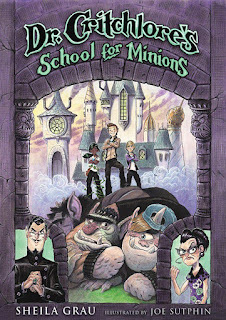 And the best place to get quality minions is from schools dedicated to training them, like Dr Critchlore's. This is where ogres, werewolves, zombies, sirens, vampires, shape-shifters, imps and even the odd human all come to learn essential skills —such as how to disarm a bomb, how to protect your EO, and how to always let your EO take the credit for successful evil-doing. For someone is trying to close down Dr Critchlore's. A series of disasters (including a troop of Girl Explorers humiliating recently graduated ogre-men minions), has seen wannabe minions flocking to rival school, Pravus Minion Academy. Worse, Dr Critchlore is not himself. Instead of running the school with an evil gleam in his eye, he's spending his days crying over TV soap operas. The professor of necromancy, Casper Vodum, is also up to something. And all of Runt's efforts to impress his instructors keep being undermined by Pismo, the new kid. Will Runt and his friends — among them, Syke the tree nymph, Darthin the aspiring gargoyle, and Frank 25 (the 25th creation of Dr Frankenhammer) — be able to save Dr Critchlore's? Is Runt really cut out for life as a henchman? And, perhaps most importantly, will he be able to get through a day without being trapped by imps? This is Hogwarts meets the Addams Family. There's no deep darkness. It's simply ghoulish fun with an original cast of characters that sends up just about every supernatural stereotype out there. A promising beginning for a new series with 'monstrous' potential! Good book and nice review. Thanks.